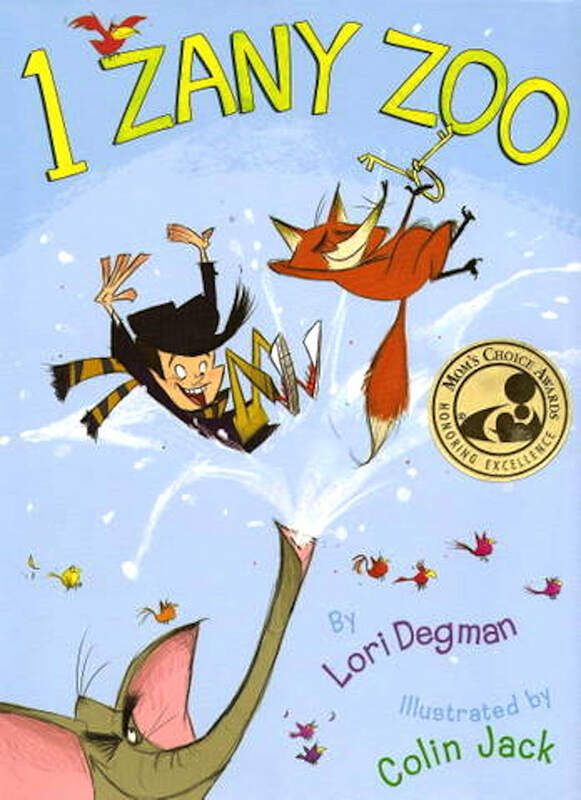 1 Zany Zoo by Lori Degman and illustrated by Colin Jack packs a real punch with a rhyming zoo bunch. This classical counting book’s tightly woven narration craftily uses animal antics and alliteration to recall a boy’s early arrival at a zoo. I love that the snappy Seussian text has been paired with equally fanciful hand-drawn ink sketches. The digital cartoon images elevate the hilarity of the romp, after all, it’s not everyday that elephants pack their trunks. A contemporary classic! Degman’s winning manuscript provides a much-needed example of a rhyming story that is in fact a story. Though the events of the morning are somewhat episodic, we do see a rise in action and feel the zookeeper’s growing frustration as he hunts for his stolen keys. The rhyming is not forced or generic, and the chaotic characters are anything but predictable. 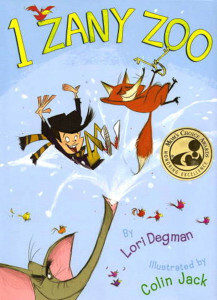 Degman gives opportunity for young readers to count and name a wide variety of zoo animals. 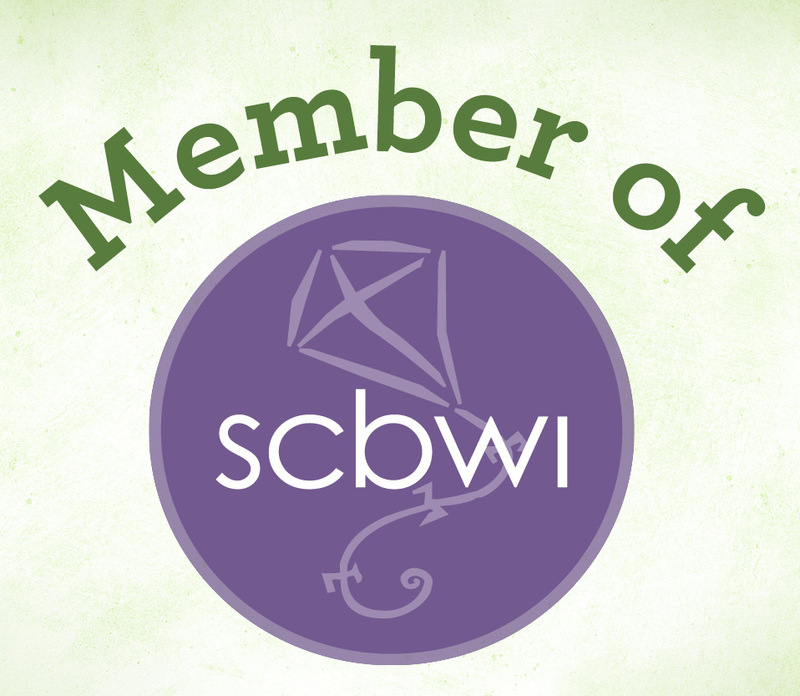 Even skunks, often overlooked in animal-themed books, get some time in the spotlight. Jack’s hilarious, expressive characters and active line work is perfect for this busy story. He provides viewers with a hidden fox on each page and plenty of details to discover each time they return to this rousing chase. Children of all ages will wait in line for good rhyming picture books. Kids, for immediate gratification, and adults, because they know how silly stanzas endure from generation-to-generation through memorization and retelling. Like colorful cotton candy, funny rhymes almost always make you happy. Yet they have extra staying and bonding power when crystallized. That’s why I’d wait in line for Lori Degman’s 1 Zany Zoo, because I know the story will stick around awhile. Few can write humor and few can write poetry, but Degman does both. And well. Jack Colins’ whimsical illustrations and retro color palette make me feel young again. They take me back to Hanna and Barbera, Loony Tunes, and Disney classics. And new, hilarious details jumps out with every reading. Bravo! Many children’s book legends were/are also picture book poets: A. A. Milne, Theodor Seuss Geisel, Shel Silverstein, Jack Prelutsky, Judith Viorst, Dan Yaccarino, Anna Dewdney, Corey Rosen . . . But agents and editors will beg you not to write a rhyming picture book. Why? Because they are drowning in poorly written submissions. 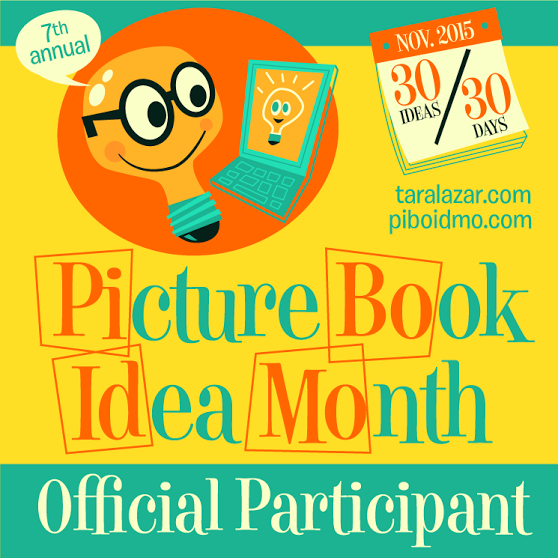 What makes a rhyming picture book so hard to write or publish? Phrases need to read smoothly, with precise beats, using words that are fresh, original, and intriguing—not the standard “you”, “to”, and “blue”. Each rhyme should be pure, but not forced. A book with too many near-rhymes, like “tag” and “bake” will annoy, not entertain its readers. A good picture book requires a plot that unfolds naturally, without being manipulated to fit rhymes. Rhyming stories are difficult to translate into other languages. These limitations make them a bigger challenge to market internationally. Yet, what books do you most cherish from your childhood? We’re willing to bet there’s at least one rhyming picture book on your list. Please share your 1 Zany Zoo comments, too!